WARNING: The products discussed may contain or use nicotine. Nicotine is an addictive chemical; in many cities and a few states, you must be 21 to purchase vaping products or products containing nicotine. Please familiarize yourself with and obey the law in your location. Last year we took a look at the Kinin “personal aromatherapy” pens, which were basically vape pens for essential oils. At the time, they came as sealed, disposable pens, and only three flavors were available. Now Kinin has switched to a rechargeable pod system and expanded to 8 available flavors, so we’re revisiting the whole Kinin system! So first, let’s take a look at the Kinin Eco itself. It is lightweight and simple, with one button and charging connectors at the bottom. Pods slide in magnetically, and while it is easy to swap them out they stay put on their own nicely. Now, when I reviewed the Kinin products last time, I pointed out they bore a striking resemblance to a traditional e-cigarette. The Eco really runs with that theme, because it looks an awful lot like a Juul (as in the vape CNN claims is enslaving teenagers on slow news days). It’s sort of understandable because there’s only so many ways to make a pod-based vaping system, but I mostly mention it because you might want to be cognizant of where you use the Kinin if you don’t want people to think you’re using a JUUL/JUUL knockoff. In any case, the pods have a few advantages over the old pen-style Kinins. For one thing, you can see how much you have in each pod, so you can better regulate when you need to order refills. Plus, carrying around 8 pods and one slim pen gives you a lot of variety. Finally, I found that the flavor hit is much stronger with the Eco; granted, many of the flavors are different, but the “recover” variety is the same and it just seems fresher and cleaner than the pen-style. I have one quibble with the Eco, and that’s the proprietary charger-a microUSB would have been really welcome instead of another cable to track. Now let’s get to the good stuff, the pods. 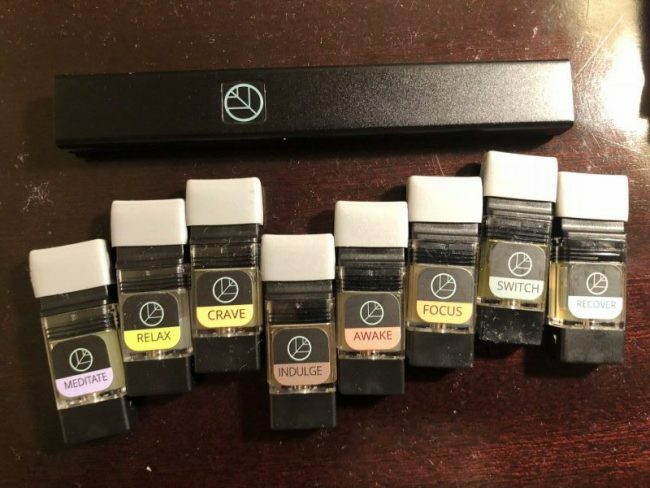 There are eight flavors in total: Awake, Crave, Focus, Indulge, Meditate, Switch, Relax, and Recover. I found Relax, Recover, Awake, and Focus to be my favorites. Unfortunately, Crave, Indulge, Meditate and Switch were all a bit overwhelmingly fragrant for me. It’s hard to explain exactly what’s different, and none of them have overlapping ingredients, but my experience was that there’s a definite difference between the two groups. I had someone else try them too, without giving my view, and they had the same feedback, so it might just be a matter of taste. However, the ones I did like were really, really excellent. I could vape on Recover all day and be a very happy camper; it’s really, really delicious. Relax is definitely soothing, and while I can’t say it’s a quantifiable difference, I do try to hit Awake and Focus when I start my day. If I had to ding Kinin for anything (besides the very JUUL-like appearance), it’s price. The individual pods range from $15-$22, and the variety pack is $120. Add in the Eco hardware, and it comes to $165. It does get slightly cheaper if you order them on an auto-ship basis, and the Eco itself is only a one-time expense. I don’t take much issue with the cost itself, as that’s about in-line with good essential oils, but it’s a lot of money for pods that you may or may not enjoy. It would be nice if Kinin offered smaller capacity sampler pods, ones that aim for 20-30 uses instead of upwards of 300-400. That way customers could determine which mixes are best for them, instead of ending up with pods that may not be to their tastes. Even just a set of sampler vials with the scents would be helpful since on paper some of the pods (like Switch) should have been right in line with my tastes, but I ended up disliking it, while others (like Awake) sounded less great when described but tasted amazing. Also, since people can be sensitive to certain smells and oils, tiny test vials would be helpful for anyone with allergy issues to make sure nothing could trigger a headache or other reaction. Overall, Kinin does a great job with making vapeable oils. They list the countries of origin for all their flavorings, they pledge to keep it to just the oils and the vegetable glycerin base, and all the pods do well at presenting well-rounded flavors. They may not all be to my liking, but they’re all well done, and the build quality for the pods and Eco are fantastic. I worried the Eco felt too light at first, but it’s been rock solid, and I’ve carried it with a pod in it in my bag, and I haven’t had any issues with anything getting detached. Honestly, if the Eco came in color options or designs beyond black, I think that would really reduce the JUUL look and make it stand out a bit more! If you’re the type to enjoy good aromatherapy, but you don’t want to run a diffuser or need it on the go, or you’re looking to break off a nicotine habit but like the oral fix that comes from vaping/inhaling, Kinin is an excellent choice! What I Liked: Flavors are bright and bold; Recover still tastes amazing; Pods pop in and out easily; Build quality is excellent; A large variety of flavors.